The biblical drama has impressive production value and cameos by Oscar-pedigreed actors such as Omar Sharif and Peter O'Toole, but it's handicapped by an inferior screenplay by Stephan Blinn -- which makes some changes to the story -- and awkward, if earnest, direction by Michael Sajbel. Still, the power of the tale's enduring theme of faithful witness in the face of persecution isn't completely diminished by the filmmaker's uninspired telling. A group of Barnard College alumnae is attempting to stop their alma mater from giving tenure to an assistant professor who minimizes Jews' historical connection to Israel. In her 2001 book, "Facts on the Ground: Archaeological Practice and Territorial Self-Fashioning in Israeli Society," published by the University of Chicago, the professor of anthropology, Nadia Abu El-Haj says Israeli archaeology manipulates evidence to justify a modern Jewish state in the region. Relying heavily on the input of anonymous archaeologists, tour guides, and tour participants, the book portrays Israeli archaeologists as ideologues who, driven by a desire to "efface Zionism's colonial dimension," have fabricated Jews' territorial claims to Israel. In "Facts on the Ground," Ms. Abu el-Haj suggests Jerusalem was destroyed not by the Romans, but by the Jews themselves due to rising class tensions among them. Yet, the 1st-century historian and scribe Josephus described in great detail the Roman siege of Jerusalem. Additionally, carvings in the Arch of Titus in Rome depict the Roman General Titus showing off menorahs and other objects looted from the Second Temple. In another passage, Ms. Abu El-Haj relates how a tourist questions a Jerusalem tour guide's explanation that the Judean King Hezekiah saved the city from an Assyrian conquest in 701 B.C.E. The tourist refutes the statement, claiming that Hezekiah's actions actually led to the destruction of the nearby Israelite kingdom. "Although the tourist's objection would appear to undermine the guide's interpretation … this is a ludicrous claim, since the Israelite kingdom had been conquered twenty-one years earlier!" an archaeology professor at Israeli's Bar-Ilan University, Aren Maeir, wrote two years ago in a University of Chicago journal, Isis. If this is an accurate representation of what the book says (always a big if in a newpaper article), it does seem daft. There's an online review by Alexander Joffe in a recent issue of the Journal of Near Eastern Studies, but it's behind a subscription wall and I can't get at it at the moment. And I see that I already noted the controversy over the book a little over a year ago. UPDATE (27 November): More here. UPDATE (28 November): If you were referred here to see my "daft" quote, please read what I actually said above, which is a little more cautious than was reported, and then read my comments, including in the update, in this post. UPDATE (28 September 2007): I have now reviewed Abu El-Haj's book here. At Mideast holy site, what is treasure? JERUSALEM -- Off an East Jerusalem side street, between an olive orchard and an abandoned hotel, sit a few piles of stones and dirt that are yielding important insights into Jerusalem's history. They come from one of the world's most disputed holy places - the square in the heart of Jerusalem that is known to Jews as the Temple Mount and to Muslims as the Noble Sanctuary. The story behind the rubble includes an underground crypt, a maverick college student, a white-bearded archaeologist, thousands of relics spanning millennia and a feud between Israelis and Palestinians which is heavily shaped by ancient history. Among finds that have emerged are a coin struck during the Jewish revolt against the Romans, arrowheads shot by Babylonian archers and by Roman siege machinery, Christian charms, a 3,300-year-old fragment of Egyptian alabaster, Bronze Age flint instruments, and - the prize discovery - the imprint of a seal possibly linked to a priestly Jewish family mentioned in the Old Testament's Book of Jeremiah. And the finds keep coming. On a drizzly November morning, Gabriel Barkay, the veteran biblical archaeologist who runs the dig, sat in a tent near the mounds examining some newly discovered coins stamped by various Holy Land powers: the Hasmonean dynasty of Jewish kings more than 2,000 years ago, a Roman procurator around the time of Pontius Pilate, the early Christians of the Byzantine Empire, two Islamic dynasties and the British in the 20th century. Oddly, there is no mention of the recent finding of an inscription in the rubble that mentions Flavius Silva. For its part, the Waqf says it wasn't destroying any evidence of Jewish presence - because there isn't any. "I have seen no evidence of a temple," said the Waqf's director, Adnan Husseini. He had heard "stories," he acknowledged, "but these are an attempt to change the situation here today, and any change would be very dangerous." I ARRIVED IN WASHINGTON late on Thursday evening. Even though the conference technically begins only today, there was lots to do on Friday. In the morning and early afternoon I went to a seminar on "How to Study the Dead Sea Scrolls: An International Working Group on Methods and Scrolls Scholarship," chaired by Maxine Grossman of the University of Maryland. She's editing a book on this topic and a number of contributors attended. I'm doing a chapter on "counterfactual history" and you can get a general idea of what it's about from this conference paper from a couple of years ago. In his recent book, _Demons and the Making of the Monk: Spiritual Combat in Early Christianity_ (Harvard University Press 2006), Brakke considers the creation of Egyptian monastic identity alongside the development of demonology. Using recent theoretical discussions of race and gender to explore the Othering of these demonic forces, Brakke's insights fit well into our theme for this year. The title for his presentation is "Shifting Strategies: Monks, Demons, and Historians." 1. "The Lady Appears: Materializations of 'Woman' in Early Monastic Literature." Journal of Medieval and Early Modern Studies 33 (2003): 387-402. Reprinted in The Cultural Turn in Late Ancient Studies: Asceticism, Gender, and Historiography, 25-39. Ed. Dale B. Martin and Patricia Cox Miller. Durham, N.C.: Duke University Press, 2005. 2. "Ethiopian Demons: Male Sexuality, the Black-Skinned Other, and the Monastic Self." Journal of the History of Sexuality 10 (2001): 501-35. A briefer and less theoretically explicit version is chapter 7 of Brakke's Demons and the Making of the Monk (Harvard University Press, 2006). I'M OFF TO WASHINGTON D.C. for the annual meeting of the Society of Biblical Literature. I leave first thing tomorrow morning. I am presenting two papers, which I have now posted online. You can read them by clicking on the links below. The second is a summary of an article that has just been published in full here. This is a volume that represents many years' work of the Early Jewish and Christian Mysticism SBL Group and it is highly recommended. I don't have a formal slot in this one, but I will be there, I've seen at least early drafts of most of the papers, and I will have some comments. These will be fairly extemporaneous, so I'm not posting anything here. In this session, we will celebrate the tenth anniversary of our group as well as the release of a volume of collected papers entitled Paradise Now. The panel will consider the questions: what contributions have we made over the past decade and where do we go from here? The panelists have been invited, but all are welcome to join us and contribute. I'll be taking my laptop and I expect to continue blogging through the conference -- as usual, as time permits. As I said, I leave early tomorrow morning. It may be two or three days before I'm back in touch. UPDATE (22 November): My other SBL posts for this year are here, here, here, here, and here. UPDATE (17 November 2010): Dead links now fixed! “This is all a political issue for some people,” Donner said, referring to Muir’s allegations. In response to questions of historical accuracy surrounding Prophet Muhammad’s ascent to heaven, Donner pointed to the historical relevance of the story of the Jewish prophet Moses crossing the Red Sea. In defense of the museum’s scholarship, both Donner and Emberling also noted that some parts of the disputed captions could have been made clearer to prevent such misunderstandings. “The label should have said, ‘According to Muslim tradition, the Prophet ascended to heaven,’” Donner said. Reflecting those sentiments, Emberling added the captions could have been improved when the exhibit was first installed a year ago. The scholars maintained that Muir’s accusations are incorrect and have not affected operations at the museum. Read it all. I have not accused the Oriental Institute of any bias (and do not), but I think the errors in the plaque should be corrected. THE EARLY JEWISH AND CHRISTIAN MYSTICISM GROUP of the SBL has its tenth anniversary this year and it is profiled in this month's SBL Forum. I've been a member of the group from the beginning. Also in the SBL Forum, Larry Hurtado has a piece on "Manuscripts and Munificence: The Centenary of the Freer Biblical Codices." AN ANCIENT LATRINE has reportedly been discovered near Qumran, and the implications are very interesting. 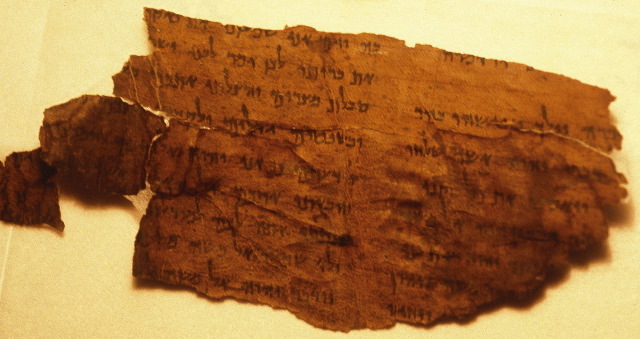 The War Scroll and the Temple Scroll don't actually refer to the site of Qumran, but it appears (assuming the research is found convincing once published) that the sectarians applied the same principles in these scrolls to their own site and the placement of its latrine. I look forward to reading the article, which is due out in the next issue of Revue de Qumran. Ninth-century Vikings almost certainly did not care that the elaborately ornamented book of New Testament works that they looted came out of a tradition including the commandment "Thou shalt not steal." Yet the Codex Aureus (Latin for Golden Book) that the men stole from a church in Kent, England, was worthy of coveting - made of purple-stained vellum pages and written in gold and silver ink. Its detailed drawings and lettering are a fusion of Roman, Byzantine, Celtic and German art. The book was so valuable that a local earl paid a ransom in pure gold for its return. The Codex Aureus is among the artifacts in the Smithsonian Institution exhibit In the Beginning: Bibles Before The Year 1000, which illustrates the Western world's efforts to transcribe, glorify and preserve the word of God. By the way, I had thought that the exhibit contains only part of Codex Sinaiticus, not the whole codex (or what survives of it), which is located in four different places. Can someone tell me if that is correct and, if so, which part is included in the exhibit? Is it the 347 leaves from the British Library? The leaves from Codex Sinaiticus on display at the exhibit in Washington is from St Catherine's monastery at Sinai, where the codex was originally discovered by Tischendorf. In 1975 when they were rebuilding the monastery, a hidden room was discovered where many new manuscript fragments were discoved, including new leaves from the Codex Sinaiticus. Why Revelation remains the most incendiary chapter of the New Testament. The question of whether religions have historically done more harm or good is one of those debates that persist well beyond their proper sophomore-year expiration date. But there is a less futile variation on the argument: What is it in specific faith traditions that can lead to dangerous interpretations? In the five years since 9/11, much time has been devoted to identifying the elements of Islam that lend themselves to a hateful jihadist ideology. Less has been devoted to what is incendiary in the other two Abrahamic traditions: Judaism and Christianity. Jonathan Kirsch, the author of several acclaimed books on religious themes, goes some way toward remedying that deficit in this thoughtful history and analysis of the most controversial book of the New Testament, the Book of Revelation. The article also discusses some speculations on the origins of the thought world that produced the genre "apocalypse." TIMBUKTU, MALI — Researchers in Timbuktu are fighting to preserve tens of thousands of ancient texts which they say prove Africa had a written history at least as old as the European Renaissance. Private and public libraries in the fabled Saharan town in Mali have already collected 150,000 brittle manuscripts, some from the 13th century, and local historians believe many more lie buried under the sand. The texts were stashed under mud homes and in desert caves by proud Malian families whose successive generations feared they would be stolen by Moroccan invaders, European explorers and French colonialists. Some academics say the texts will force the West to accept Africa has an intellectual history as old as its own. Others liken them to the Dead Sea Scrolls. The talk is that more than a million manuscripts may survive there. As noted before, some are in Hebrew and Greek, as well as Arabic. Note this as well, and for both posts follow the links back from there. UPDATE: Scientific American has a longer version of this article. A touring exhibit that promises to transport people back to the Holy Land as it was thousands of years ago opens Monday in Columbus. ``From Abraham to Jesus'' is a nearly 40,000-square-foot exhibit that blends biblical stories with historic artifacts and modern technology to take visitors on a walk through the birth of Judaism and Christianity. It features some of the Dead Sea Scrolls; the ossuary, or bone box, that archaeologists believe held the remains of a son of Simon the Cyrene, who carried the cross for Jesus; a musical score produced by national recording artist Don Moen and a 5,000-square-foot bazaar.